Marie Killick started her business in Maida Vale, London, manufacturing steel recording cutters for direct recording on the battlefields for the War Office. Below, you can explore the complete timeline of Marie’s invention and legal battles. 25th October 1945: Application for British Patent to cover Marie’s invention of sound reproduction stylus. Marie had also applied for patents covering her stylus around the world. Pye Radio Ltd opposed her application for a patent – they claimed it was not novel or valid. Decca Ltd offers Marie £75,000 for her British Patent rights. They stated that it had passed all known tests and it was the best thing on the market. Marie refused the offer. Marie enters into a contract with Shannon & Bishop for sole distribution rights of her stylus Sapphox. They agreed to take delivery of 1,000, quickly raising to 2,000 a week as demand rose. They broke their contract when they heard there was something similar on the market. 8th June 1948: Complete specification pf Marie’s invention accepted by the Patent Office. Marie flew to Switzerland to try and find other markets and start up manufacture there. Unknown to Marie, Pye and other firms started to manufacture her invention. 16th May 1949: Letter from Circuits Management Association Ltd regarding the outstanding sound quality of Sapphox. The management placed Sapphox in their Odeon cinema in Leicester Square in London. During the six month run of the film Hamlet they had used Sapphox on the two sets of records played during the interval of the film. The quality of the sound was such they were going to use Sapphox in all their cinemas as installations were made. Marie put her British Patent up for sale to test the market and try to find out what the cause of the blockage to her business was. Pye Ltd was one of the firms who responded to the advertisement. At a meeting with her Pye stated, they had been making and marketing her invention very successfully – that they were a million air company and would come to a settlement with her. Marie informed them they would be hearing from her solicitor. E.M.I. Responded to the advert for sale of the patent. On learning that it was Patent 603606, they told her that the patent had lapsed in October 1949. Marie applies to have the patent restored – claiming her patent agent Gill Jennings & Every had neglected to pay the fees. They also neglected to pay the fees for her other patents granted in other countries. 5th December: Claiming that her patent agent neglected to pay the renewal fees, Marie applies to have British Patent 603606 restored. 13th February 1951: Pye objects to the restoration of the British Patent on the grounds that failure to pay the renewal fees was not unintentional and that there was undue delay in the making of the application. They also so stated that since the date of the Patent’s lapse “They had commenced the manufacture of a sapphire stylus to which the patent relates. They also stated “It was only when she learned that the opponents were making sapphire styli that the patentee wished that the patent had been renewed. 17th September: Marie’s solicitor writes to Pye requesting the number of styli manufactured between October 1949 and November 1951, and then outside the period of the lapsed patent. Also how many styli exhibited in Exhibition in Earl’s Court. They also want to know the number of styli made to Marie’s design they have in stock. They also request Pye’s manufacturing drawing. At a meeting with Mr Schuman of Cosmocord asked Marie if she would consider manufacturing 20,000 a week. This firm were under sub-contract to Pye Ltd.
Marie obtains a Legal Aid Certificate to fight Pye. 4th August 1953: Writ issued on Pye to restrain them from infringing Marie’s patent covering her sound reproducing stylus and an enquiry delivery up of all infringed articles. Measurements of Pye’s ‘Universal’ stylus taken by National Physical Laboratory. 1st May 1955: Pye tries to get Marie’s Legal Aid Certificate revoked and put in a counterclaim that the Patent was invalid. Similar view of her Patent agent on application for a patent. They also state her Patent is dubious and a court case is not in the National Interest! 21st December: Judgement given in Marie’s favour by Chancery Division of High Court of Justice. An injunction to restrain Pye from manufacturing or selling the infringed stylus was made by Justice Lloyd-Jacob and an order to deliver up to Marie or destroy under oath, the remaining infringed articles. Note: in 1957, 30,000,000 records were sold in the UK alone. Pye claimed to have only manufactured 50,000 stylus infringing her patent. 22nd July 1958: Pye Ltd lose their Appeal against the Judgement in the High Court. There are no grounds for Pye to appeal to the House of Lords. Marie and her solicitors and accountants start compiling evidence of the damage she suffered due to their infringement. At some time in 1958 Pye took out a debenture with Prudential insurance for 2 and a half million pounds to cover their retailers against any claims to damages that Marie may take on their retailers for selling Pye’s infringed styli – hardly necessary if they had only manufactured 50,000. 25th July: The National Press report meeting between the large musical combines to discuss the consequences of the Judgement against Pye on themselves. It was during July that Marie circulated a memo to all electrical and musical wholesalers in the U.K that it was her intention to re-start manufacture of Sapphox. Prior to Mr Dicks resignation, he suggested to Marie that he be allowed to take over the patent as she would never be allowed to manufacture! September: In September Marie sends a telegram to Prime Minister McMillan re: blockage to her moves to restart manufacture of Sapphox. Mr Thomas, her landlord whilst fighting the case in 1956-1958 had agreed to wait for settlement of rent until her damages were awarded. He now moves to have the debt settled prior to the damage settlement. Her solicitor Mr Dicks resigns from the damage inquiry leading to delay while Marie finds new solicitors. Many are eager to take it on but refuse to go forward after having talked to Mr Dicks. 27th November: Letter from the Law Society, states they have received a request from Mr Dicks of Kidgell & Co to be released from acting for her. 29th November: Marie makes a statement re: Mr Dicks giving up the case. Private detectives report that Mr Dicks is being followed. Business colleague Duncan Loades also followed and felt threatened by two men. He took refuge in a nightclub and took a taxi back to the Park Lane Hotel where Marie was staying. 5th December: Marie informed by Mr Dicks that if she does not appoint another solicitor her Legal Aid Certificate will be discharged! 10th December: Letter from a business colleague Kenneth Aitken to Marie re: difference in attitude and appearance of Mr Dicks over the last four weeks. He advises her to get another solicitor to deal with the inquiry! 11th January 1959: Telegram to Justice Lloyd-Jacob regarding the blockage Marie is experiencing in pursuing the assessment of her damage claim against Pye. She has tried four solicitors who all believe that the matter is to complex for them. She is also experiencing anonymous phone calls (see documents). 31st January: Mr Walker, (her junior council during the infringement case) also refuses to act in the assessment of damages, claiming it is a separate matter from proving infringement. He shares the same chambers as Mr Johnson, Pye’s leading council during the court hearings. Note: Solicitors after talking to Mr Dicks decides not to take the case because Mr Dicks questions the amount of damages due to Marie! 12th February: Marie finally finds a solicitor prepared to take on the damage enquiry against Pye. 21st February: Bankruptcy notice served on Marie. Marie denied that she owed Mrs Thomas (petitioner) the debt. 24th February: Musical Trade deny knowledge of Marie’s Sapphox or Pye’s Dual Purpose stylus when enquires are made by potential backers for manufacture of Sapphox. Potential backers withdraw from negotiations. 18th March: Bankruptcy Notice issued 8 months after the judgement upheld against Pye in Marie’s favour in Court of Appeal. Marie still trying to have the judgement in Mrs Thomas’s favour for debt set aside. 11th April 1959: Letter from Mr Dicks to Pye’s solicitors re: Heads of Damage. Why is Mr Dicks still involved 5 months after resigning from the case? 17th April: Summons to have the judgement of Mrs Thomas set aside. Marie contends the debt was to Mr Thomas supported by agreement she holds in letter form. 21st May: Registrar dismissed Marie’s application to have judgement in Mrs Thomas’s favour dismissed. “In view of her considerable liabilities that it is in Mrs Killick’s and her creditors’ best interest that she be made bankrupt – but that is a matter for the plaintiff (Mrs Thomas) to decide”. What prompted this remark – what evidence did he have for this statement, was it simply a rumour, that the damages would not amount to much? WAS HE INTERFERING WITH A HIGHER COURTS JUDGEMENT THAT A INQUIRY INTO DAMAGES SHOULD TAKE PLACE? 26th May: Receiving Order made against Mrs M.L.Killick on the Petition of Mrs L.M.Thomas filed on 26th May 1959. That an act of Bankruptcy has been committed. 29th May: Opinion of Marie’s council. “if you are made bankrupt I think you will find it extremely difficult in carrying on these proceedings”. (Inquiry into Damages due her from Pye) “as your affairs will then be controlled by a trustee in bankruptcy”. Pye later bought a debt to give them a say in her bankruptcy and settlement of her damage claim! 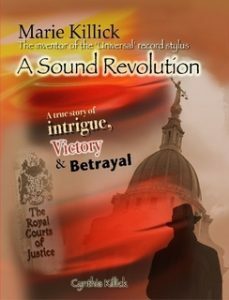 29th July: During the hearing in the Brighton County Court Marie’s counsel pointed out to the Registrar that Mrs Killick had a judgement in her favour and that she would get damages as a result of the judgement. The Registrar stated. “That is an empty judgement”! 31st July: Mrs Killick to attend the Office of the Official Receiver on 6th August at his office. This was all accomplished in just 7 months from the writ being issued against Marie by Mrs Thomas. September 1959: Marie was still battling on trying to prevent the Official Receiver from settling her damage claim for a derisory amount (£4,330). She flew to Paris to negotiate with the Banque de Paris for a loan of £25,000 on security of a ¼ share in her British Patent, when she received a summons to return to Britain to attend the Creditors Meeting on the 8th. Marie returned with a draft agreement and requested of the Official Receiver that she be given a few more days to conclude the deal and settle her debts in full and take back control of her damage claim and re-start manufacture of Sapphox. He omitted to tell the creditors of the agreement and recommended that Marie be declared a bankrupt. Negotiations with the Banque de Paris came to an end. Marie started proceedings in the courts to prevent the Official Receiver from settling with Pye. Mr Yelland, the Assistant Official Receiver informed Marie at a meeting that she had not been adjudicated Bankrupt and he would approve any negotiations for the sale of assets, which would enable her to clear her debts. Why then did the Official Receiver refuse to give her time to return to Paris to conclude the deal involving her British patent? 11th September: The Official Receiver Mr Parker writes to Marie to inform her that as she has now been adjudicated bankrupt that he has a duty to take possession of and protect the assets which now vest in him. He requests all Marie’s books, accounts and any documents that relate to her claim against Pye Ltd to substantiate the claims against Pye. 28th September: A Trustee in Bankruptcy is appointed Mr Bradley-Hole. He informs Marie that she is at liberty to negotiate the sale of the British Patent until the final stages, when the details must be submitted to him to deal with final negotiations. He writes to the Westminster Bank to this end. 16th October: Letter from Mr Bradley-Hole to Marie to say that he has received notice that a fee of £20 must be paid by the 25th of the month if the British Patent is to be kept in force for a further year. He states that he has no funds and the position was reported to the Committee in Bankruptcy at a meeting but the Committee is not prepared to advance the money to pay the renewal fees! Marie raised the fee and kept the patent in force. Note: what was the Official Receiver thinking of, since the assets were invested in him – why was he prepared to allow the patent to lapse? The patent and the damages due Marie were the only assets she had! So this is the Patent that is not worth £20 renewal fee and also not worth the Official Receiver seeking to sell or produce money from it! A three years legal battle between the Official Receiver and Marie ensued. She sought to prevent him from settling with Pye. Unlike the Official Receiver, Marie continued in her efforts to find a buyer for her patent. Negotiation after negotiation fell through once the Official Receiver was brought into the picture. Pye had tightened the net around Marie making it impossible for her to free herself of the bankruptcy. Marie battles with the Official Receiver through the courts, to prevent him from settling with Pye Ltd.
Marie, determined not to be robbed of her damages, had battled on through months of pain and illness. Eventually, pneumonia, cancer of the spine and lungs took her life on 20th January 1964. She died penniless and homeless after the Official Receiver, despite all her efforts to prevent him, settled with Pye Ltd for £4,330 – not only robbing Marie her due but her creditors only received 2 shillings and 6 pence in the pound of debt owed them!